New Late Evening Ferry on Friday Evenings. Getting to Clare Island for the weekend will be much easier to achieve on a Friday evening this year. 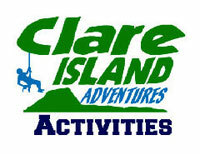 Stay up to date on clareisland.info, or by signing up for our newsletter here. Our 4th annual adventure race is set for Saturday, April 30th. And despite our already great value entry fees of just €45 (full race) ad €35 (spirit race), we’re also offering a 10% discount for Early Birds who register in the month of January. So, if you’re determined to finally get fit this year, this is the time to commit – and save money! With two options to choose from, our race will appeal to both experienced and novice adventure racers. And here on Clare Island, we’re always looking for the craic. So, we promise you a great day (and night) out, no matter the weather or your race result. We’ll have live music and rocking banter in the Sailor’s Bar on Friday and Saturday night so we suggest you consider checking into Go Explore Hostel and making a weekend out of it. Get the full low down on this link. Happy Christmas from Clare Island Adventures. From all of us at Clare Island Adventures, we wish you a happy, safe and peaceful Christmas. Don’t forget to look us up in 2016 and come visit. We’d love to take you on an unforgettable adventure. Once again, we’re inviting single people with an interest in the great outdoors to come and mingle on our shores, but this time it’s a gay and lesbian singles weekend. Following the last weekend in June, we received some enquiries about whether the event was open to gay participants, or was strictly straight. While our policy to begin with was to make it open to all, we recognised that the general assumption was that it was geared towards straight people and the turn out on the last three weekends seemed to reflect that. So, to even things up – and create clarity for everyone who attends – we’ve decided, going forwards, to dedicate September to gay and June to straight. So, if you’re gay, free and single, we’d love you to make the trip across the bay and join us for a weekend of adventure and craic.The dates for your calendar are September 25th to 27th. 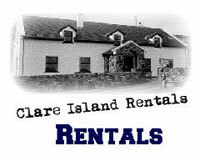 Clare Island was once well known for a more traditional style of singles weekend – a highly successful match-making festival that ran twice a year for 15 years. But our newer version – established in June of last year – has replaced match-making with adventure and has proven itself to be a popular format. The weekend will appeal to those attracted to high (and medium) adrenalin-inducing outdoors activities. The idea is to bring like-minded people together and put you through a programme of activities that necessitate interaction and co-operation. After that, it’s up to yourselves – to connect with new buddies, BFF’s or possibly even soul mates. Ensuing relationships are a bonus. The weekend is primarily about getting out there and having the craic with other people in the same boat as you. With three weekends now under our belt now, we’re very pleased with the response so far. Departing Roonagh Pier on Friday evening, the group will be kept busy with lively interactions over the weekend. The evenings on the island will be choca-bloc with delicious meals, music, banter and other craic in the Sailor’s Bar & Restaurant. A beach challenge on Saturday morning will start the day with lots of laughs. In the afternoon there’ll be a choice between coasteering (for the water babies), climbing & abseiling (for those with a head for heights) or hiking the stunning island that is famed for its magnificent views and its abundant flora and fauna. You’ll be back on the mainland again by lunchtime on Sunday, allowing plenty of time to leisurely explore Louisburgh, Leenane or Westport and still be homeward bound by early evening. Singles of all levels of experience (including none) are welcome for all activities. There are some basic requirements (such as being comfortable swimming in the sea if you opt for coasteering), but the instructors will ensure a fun and safe day out for all, even complete beginners. As long as you have a can-do spirit, you’ll be grand! For full details, just click this link. Are we the winners of the Best Day Out in Ireland? We’re getting excited! Earlier this month we made it onto the Top 5 shortlist in the Irish Times search for the Best Day Out in Ireland. There were 1900 entries, nominated by members of the public, and two Mayo entries made it as far as the Top 20 long list: ourselves and the fabulous Great Western Greenway. But with the overall winner to be announced on Saturday, we alone are flying the flag for Mayo. Can we do it? For us, it means a great deal to be included on this list. It is a testament to the pride that all of our teams take in their work and it also helps to promote general awareness of what Clare Island has to offer. But, in particular, it highlights the quality of our instructors and of the overall experience we provide here at Clare Island Adventures. This is the fourth year that the Irish Times has run a competition of this type and Mayo has picked up the overall prize twice, with Westport winning the Best Place to Live in Ireland in the first year and Erris winning Best Place to Go Wild in Ireland last year. We await to see if we can make it a hat trick for Mayo. Meet the Woman of your Dreams on Clare Island. Calling all the outdoorsy single men – get your helmets, wetsuits and harnesses on. From June 19th – 21st a fun and adrenalin-filled weekend of outdoor adventure will be taking place on Clare Island, specifically designed with single folks in mind. And so far it’s looking like there’s a wee bit of an imbalance: more women than men! Jam-packed with adventure activities, the weekend will deliberately steer away from any cheesy match-making. Instead, the focus will be on providing an environment where single people who enjoy being active in the outdoors can hang out, do some exploring and some adventuring with other like-minded singles. This is a Singles Adventure Weekend, NOT a match-making festival. Beginning and ending with a short ferry trip (where you might be accompanied by dolphins or basking sharks), the schedule includes a beach challenge, a choice of coasteering, rock-climbing & abseiling, or hiking, delicious meals, optional set-dancing lessons, much banter and live musical entertainment. All against a backdrop of magnificent views – whether outdoors or in. All gear will be provided plus full instruction, so previous experience isn’t a requirement. Just an up-beat, can-do spirit will see you through. There’ll be some activities involving all the group, others broken down according to individual interests. But there’ll be plenty of mingling in the bar at mealtimes and in the evening – nothing corny, just a bunch of new buddies swapping tales of their adventures. Departing Roonagh Pier on Friday evening, you’ll be back on the mainland again by lunchtime on Sunday, allowing visitors from beyond Mayo plenty of time to leisurely explore Louisburgh, Leenane or Westport and still be homeward bound by early evening. All in price of €215 includes return ferry, two nights Bed & Breakfast in the very comfortable Go Explore Hostel, dinner on Friday and Saturday night, lunch on Saturday, plus all activities. Click here for full details. So our third adventure race took place on Saturday and – as expected – we had another great day. Congratulations to all who took part, especially given the threat of awful weather that hung over them. Check out the results below and the photos on our Facebook page. And make up your mind today that you’ll be there next year! Saturday, May 2nd is Mayo Day – a global celebration of our beautiful county aimed at reconnecting the 9.3 million Mayo Diaspora around the world, who are encouraged to join us in celebrating this beloved county in their own corner of the globe. And we’re marking the occasion by running an adventure race. Now in its third year, the Clare Island Adventure Race kicks off at 1pm, with registration opening at 11.30am (but you can pre-register here). A unique twist (walking the plank) in deference to the island’s most infamous ancestor, Grainnuaile. Great value at just €45 for the full race and €35 for the Spirit race – including return ferry fare if you pre-register by Friday, May 1st. But the most outstanding thing of all is something that can’t quite be expressed in words and certainly can’t be experienced at other adventure races: the setting of Clare Island itself. If you’ve been, you’ll know what we’re talking about. If you have yet to come, let us assure you it will steal your heart, as it has ours. If you’re looking for a memorable way to mark Mayo Day, or something different to do over the bank holiday weekend, then think about joining us. Go Explore Hostel is officially open for the season and there’ll be great craic at the after-party in the on-site Sailor’s Bar & Restaurant. The hostel has a fully equipped self-catering kitchen, or if you’d rather relax and be served your food, they serve delicious and fresh-prepared meals with the bay as your beautiful backdrop. For all you need to know, visit the race page and pre-register today. For those of you who have a full two weeks off, we hope you’re enjoying it so far. Shame about the poor weather this week, but we’re promised an improvement in time for Easter weekend – yay! And Clare Island is ready and waiting to welcome you. 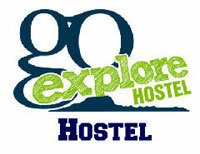 Go Explore Hostel is open from tomorrow, Friday, April 3rd until Sunday, April 12th. In addition to stunning views, the hostel has a fully equipped self-catering kitchen, contintental breakfast included in your stay and an onsite bar and restaurant serving excellent food if you’d rather not cook. What better base to explore all the island has to offer from? And we’re available to take you on an adventure of your choice: coasteering, snorkelling, raft-building, rock-climbing & abseiling, or hiking. Minimum group size is four, minimum age is twelve, and pre-booking is necessary – contact us now on 087 3467713. We hope to see you here! But either way, have a great break. We hope you had a nice rest over the Christmas period and are now raring to go, and looking forward to all that 2015 might bring. If increased fitness, or just more action in the great outdoors, are among your new year resolutions, then why not sign up to the Clare Island Adventure Race on Saturday, 2nd May? And to help you commit, we’ve got a little enticement: everyone who registers in January will be entered into a draw to win free entry for a friend! Our race fees are already great value at just €45 for the full race and €35 for the shorter course. But free would be even better, eh! To learn more about this year’s event, just follow this link to the race page. We hope it will answer any questions you may have, but if there’s anything else you’d like to know please get in touch via bookings@clareislandadventures.ie or 087 3467713. My husband and I stayed one night in this hostel. We arrived on the early morning ferry in a heavy mist and were very happy to be able to get a great cup of coffee to warm us up as we sat in the beautiful Common Room. We watched the mist clear through the huge windows. The food in the Sailor's Bar is great, fresh and imaginative. The bedrooms are spotless with firm mattresses, immaculate bed linen and a clean modern bathroom. Carl and Sabrina were helpful and friendly and nothing was too much trouble. The atmosphere in the hostel echoes that of the whole island - relaxed, safe and friendly; We will definitely visit again.